R wrapper around the argon HTML library. More at < https://demos.creative-tim.com/argon-design-system/>. ArgonR primarily aims at building static webpages, without the need of shiny or server part. However, it can be also used within shiny packages such as argonDash, a bootstrap4 shiny dashboard. See here for more details. On apache or nginx server: copy example.html and the inst folder to the root of your web server. Enter the web server adress in the web browser. 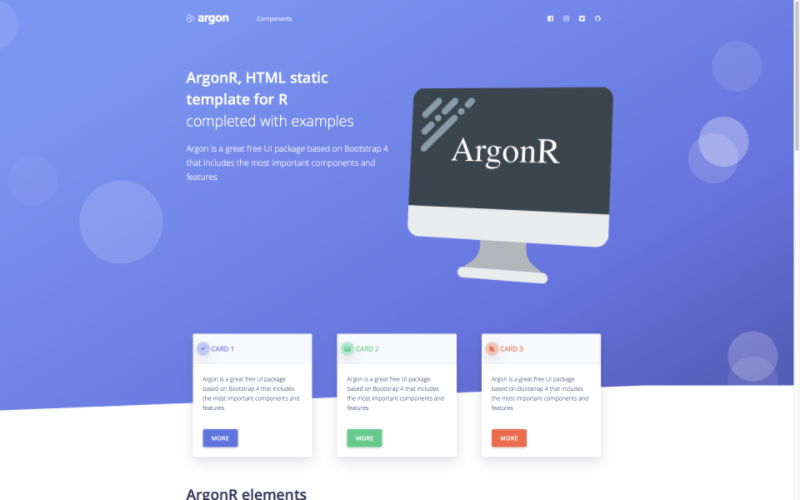 Many thanks to CreativeTim for creating argon HTML.